OBTAINING AN SAESS SPRINGER - Saline Acres English Springer Spaniels. Saline Acres English Springer Spaniels. Are you my new Mommy? Simply read the entire page and then get in touch. The contact page has all of our numbers, address, map, mail link, etc... Use any, or all as necessary. Please be patient. :) We try hard to answer all correspondence promptly. But, we do have full time jobs, 8 acres, etc... to keep us busy. We will always do our best! We reserve the right to not sell to anyone we choose, and to stop an already approved sale at any time before the dog is received. Not all folks are a good match for a medium sized, energetic breed. We will ask many questions about you, family, house, yard, other pets, etc... to verify a good match. Saline Acres will never refuse a sale for reasons that could be considered hateful, or discriminatory. 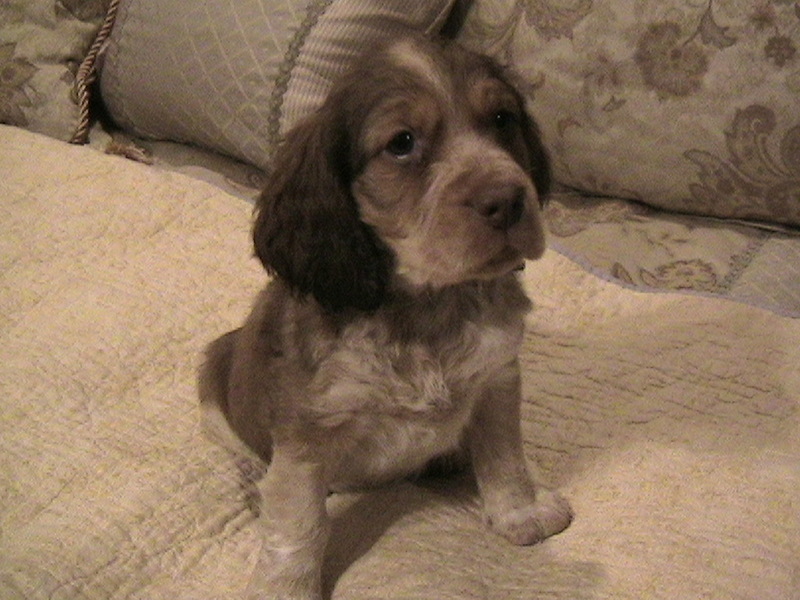 All our pups are sold with a "limited" AKC registration only (not registered for breeding. Any puppies not registerable). From a business standpoint, not many offer all that we do in a pup, and we like it that way. More importantly, from the heart, if someone was to misrepresent themselves so as to get one of my pups for use in a "mill" my heart would break. Should you be a breeder with a facility close enough for me to visit in person an exception may be made. Should this be the case, and I approve you, expect the listed price to at least triple. Pricing will vary for each litter, and will be listed on the puppies page. Should you choose a puppy from us it will be it will be the happy healthy pup that is expected. All receive the necessary checkups, age specified shots, wormings, etc... All will have tails docked and dewclaws removed unless other prior arrangements have been made, at the proper age (2-4 days). Your pups litter will be registered with the American Kennel Club, and will come with the necessary paperwork to place him/her into you name. You shall also receive a copy of the litter certificate, health record, tag if old enough for a rabies shot, and a copy of any veterinary receipts. Although we do not claim to be experts, we are always here to try and help with any future problems you may have. Should you live close enough for pickup of your pup you are free to do so. Plan some extra time to meet the parents, and visit the facility. Bring anything you need for the trip home (crate, leash, collar, etc...). Be prepared some get carsick in their younger days. If you like your pup can be shipped to you by air. They will fly by Delta Airlines. I have shipped across the nation for as little as $286.00, and as much as $650.00. It depends greatly upon weight and size. Finding an appropriate flight can be the toughest part. I will do the legwork on this, and it will sure be a testament to how well we can work together, as it needs to fit both our schedules. All those that are shipped require having a U.S.D.A. health certificate filled out by a competent Vet, and a shipping rated crate. Both being a cost you need to consider.